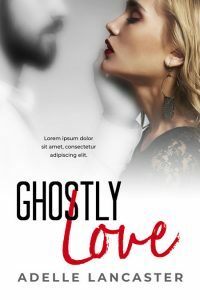 This paranormal romance book cover features a woman and a man. The man is a ghost with a beard and mustache. The top half of his face is not shown. The woman is blond with red lipstick. The man is holding one hand up to the woman’s face. This young adult book cover features a young woman wearing a black leather jacket and a red plaid skirt. She’s blond and the top half of her head is now shown. She’s standing outdoors. There are trees and a building int he background. This holiday romance book cover features the legs of a man and a woman against a brick wall. The woman is wearing a dress. The man is wearing a suit. Their legs are wrapped in a string of purple lights. 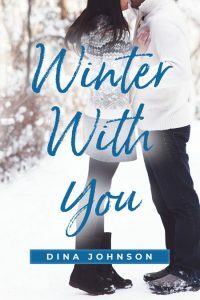 This young adult winter romance book cover features a couple in the snow. A young man is giving a young woman a piggy back ride. There are smiles on their faces. Snow covered trees are in the background. 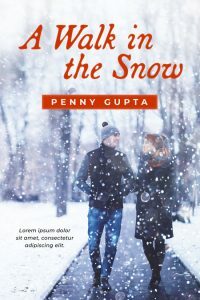 This young adult Christmas romance book cover features a couple standing close together in the snow. They are wearing winter clothing. The top half of their faces are not shown. 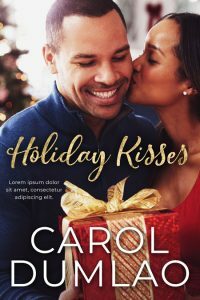 This interracial Christmas romance book cover features a happy couple wearing Santa Claus hats. They have their heads together with their eyes closed and smiles on their faces. The man has a beard. The woman is African-American. They’re holding a present wrapped with brown wrapping paper and red ribbon. 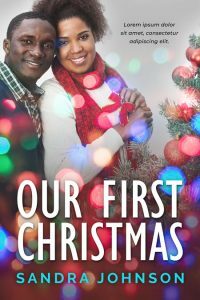 This African-American Christmas romance book cover features a happy black couple. They are standing close together next to a Christmas tree with smiles on their faces. Colorful bokeh lights cover the design. This winter romance book cover features a couple laying down on a red blanket outdoors. The are kissing. The man is wearing a gray beanie and has a beard. 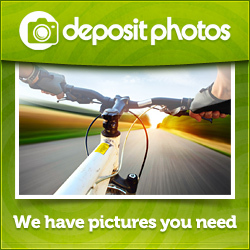 The woman is brunette with long hair. They are both dressed in winter clothing. 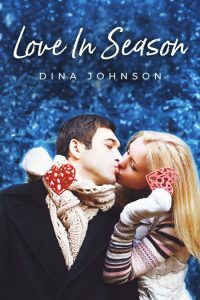 This Christmas romance book cover features a couple kissing. They are wearing winter clothing. The background is a sparkly blue. The woman is holding two hearts, one in each hand. This Christmas romance book cover features a couple in an embrace. The man has his arms around the woman. You can only see the man’s arm and hand and his body. The top half of her face is not shown. A Christmas tree is in the background. This African-American Christmas romance book cover features a happy black couple. The woman is kissing the man on the cheek. The man has a big smile. The man is holding a present wrapped with red wrapping paper and gold ribbon. A Christmas tree is in the background. 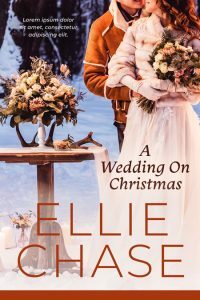 This Christmas romance book cover features a bride and groom standing close together in the snow. The man has his arms around the woman. The woman has red hair. The top of their faces are not shown. They are standing next to a small table with flowers on it. The woman is holding a bouquet of flowers. 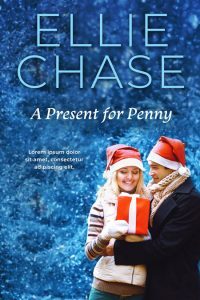 This Christmas romance book cover features a couple walking on a path in the snow. They are facing each other. The woman is holding onto the man’s arm. 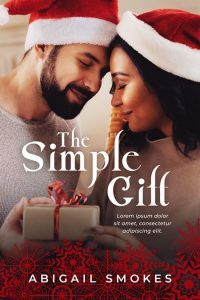 This Christmas romance book cover features a couple standing close together holding a present that’s wrapped in red wrapping paper. Both the man and the woman are wearing red Santa hats. They are wearing winter clothing. The background is a snowy blue background. This African-American romance book cover features a black man kneeling down and kissing a pregnant woman’s tummy. The woman is standing and is wearing white. Only the woman’s stomach is shown. The man has his hands around the woman’s tummy. 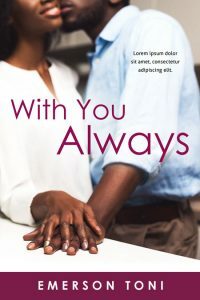 This African-American romance book cover features a black couple standing close together in the kitchen. They both have a hand on top of the counter. The woman’s hand is on the man’s hand. They are happy. The top half of their faces are not shown. This new adult romance book cover features the legs of a man and a woman laying down on the ground. The upper half of their bodies are not shown. The woman is wearing a man’s white dress shirt and no pants. The man is wearing jeans. They are barefoot. 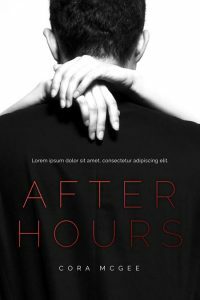 This steamy romance book cover features a close-up of a woman’s legs wrapped around a man’s waist. The man is wearing a suit or tuxedo. The woman is wearing white shoes. The saturation is high. 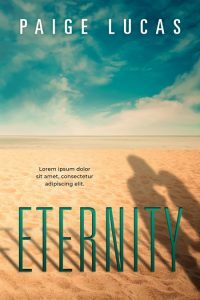 This contemporary romance book cover features a beach with a shadow of a couple kissing. The title also casts a long shadow. This romance book cover features a close-up of a man’s head and back. There are woman’s hands and arms wrapped around his neck. The cover is black and white. The man is wearing a suit or tux jacket. 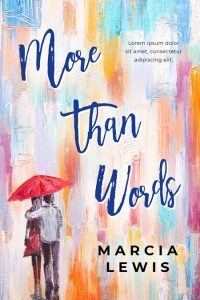 This women’s fiction / romance book cover features a painting of couple walking close together under a red umbrella. They have their backs to the viewer. The couple is small and the rest of the cover is covered with various colors. 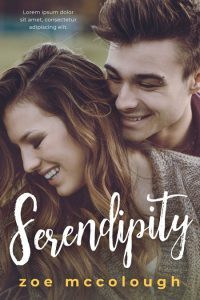 This interracial romance book cover features an interracial couple. The man is black and is wearing a suit and tie. The woman is brunette and white. She is behind the man and has her arm around the man. The both of serious expressions on their faces. 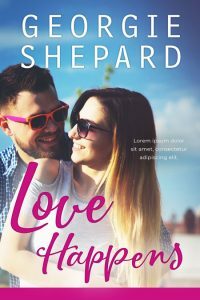 This contemporary romance book cover features a smiling, happy couple. The man is holding the woman from behind and the woman is looking back at him. They are both wearing sunglasses. It’s a sunny day and the sky is blue. 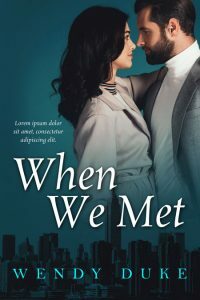 This romance book cover features a couple standing close to each other. It looks like they are about to kiss. They are looking into each others eyes. They are both brunette. The background is a dark teal color. There’s a silhouette of a city skyline of New York at the bottom of the cover. 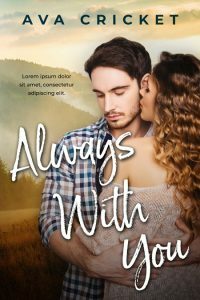 This contemporary romance book cover features a couple who are about to kiss. The man is wearing a jean jacket. The woman is wearing a blue blouse. 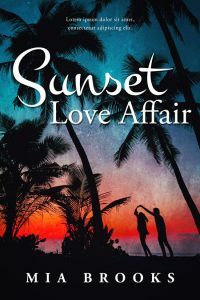 This contemporary romance book cover features the silhouette of a bunch of palm trees and a couple dancing on a beach. The background is colorful and has a gritty texture. 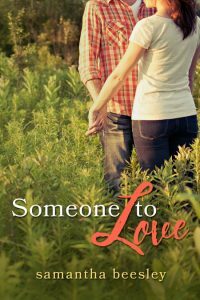 This contemporary romance book cover features a couple standing in the middle of a grassy field in the country. They are holding hands. Their heads are not shown. The woman has brown hair. This women’s fiction / romance book cover features a woman leaning against a hay stack in an open field. The woman is wearing a black and white polka dot dress. Her head is not shown. 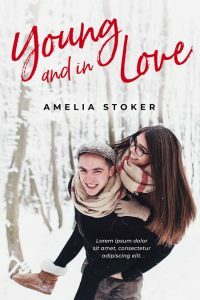 This contemporary romance book cover features a close-up of a young couple. The man and the woman are both smiling. The man is behind the woman. One of his eyebrows are pierced. 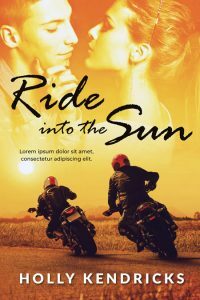 This romance book cover features two people riding motorcycles during sunset (or sunrise). They are riding towards the sun so their backs are to the viewer. At the top of the cover there’s an image of a couple. The woman has the man’s chin in one of her hands.